If you're looking for a change from the standard tuna-noodle casserole, give this flavorful combination a try. The asparagus and chicken elevate the classic to a new delicious level. It's especially easy to make if you use a store-bought rotisserie chicken for the dish. Preheat the oven to 350°F. Have ready an 11 x 14-inch baking dish or casserole. Bring a pot of salted water to a rapid boil. Add the asparagus and cook for 1 minute. Remove the asparagus from the pot with a strainer, rinse under cold water, drain well, and reserve. Cook the noodles in the same pot of salted water for 1 minute less than the directions. Drain the noodles well and transfer to a large bowl. Melt the butter in a medium saucepan. Add the onions and cook over medium-low heat, stirring often, for about 3 minutes, or until beginning to soften. Add the garlic and flour, and continue cooking, stirring constantly, for another 2 minutes. Whisk in the milk, mushroom soup, salt, and pepper, and cook, stirring often, until the mixture begins to simmer and thicken. 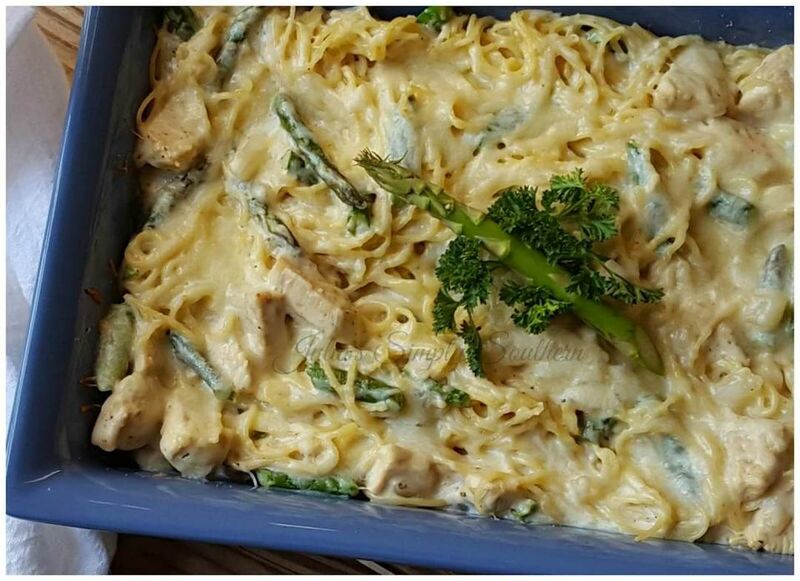 Add the sauce to the bowl of noodles along with the chicken, asparagus, and half of the cheese, and mix with a spatula to combine. Pour the mixture into the baking dish and top with the remaining cheese. Mix the breadcrumbs and olive oil in a small bowl until well combined and spread evenly over the casserole. Bake for 35 minutes or until bubbling and browned. Store any casserole leftovers covered tightly in the refrigerator for up to 3 days. To rewarm, cover with aluminum foil and place in a 350°F oven until heated through.